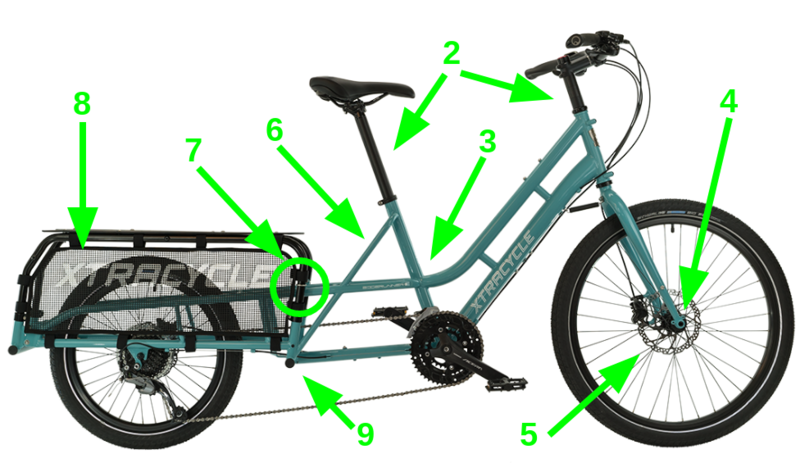 As we refine and evolve the EdgeRunner, our goal is to simplify the decision-making process—while at the same time putting our all into a stylish and refined cargo bike. 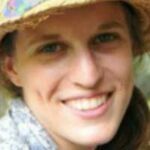 In previous years, we’ve had various models that were different in a multitude of ways. 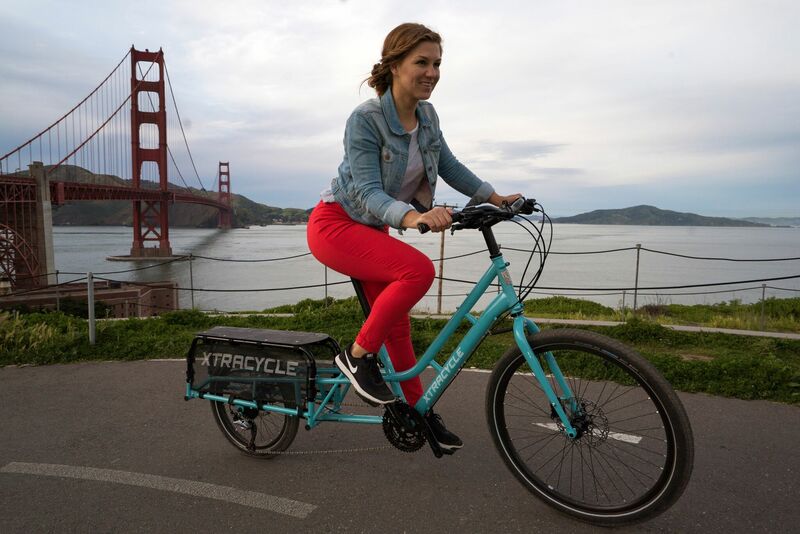 We’ve since fine-tuned our product lineup to include two stellar bike models: the EdgeRunner Swoop and Classic, as well as their respective electric-assist versions, the e-Swoop and e-Classic. Along with nearly a dozen frame upgrades (detailed below), the Swoop frame has a low step-over height to accommodate a wider range of rider heights, with a frame that is strong, sleek. and up to the task of any passenger or cargo load. Combined with our signature 20-inch rear wheel and low rear deck center of gravity, this makes for a super-rider-friendly cargo and kiddo hauler. The Classic includes all the same frame upgrades but maintains that “classic” EdgeRunner frame geometry, with a slightly higher step-over height. 1. All Chromoly frame: The EdgeRunner Swoop and Classic have frames made with all Chromoly steel, whereas some earlier models featured a combo of Chromoly and high-tensile steel. 2. Universal sizing: Our frames come in universal sizing, which makes ordering easier and gives the bikes a wider range of fit. Earlier models had two different frame sizes: S/M and M/L. All frames for the ER Swoop and Classic are the same size and when you order your bike, you will get a fully adjustable seat post and handlebar stem to dial in the perfect fit. 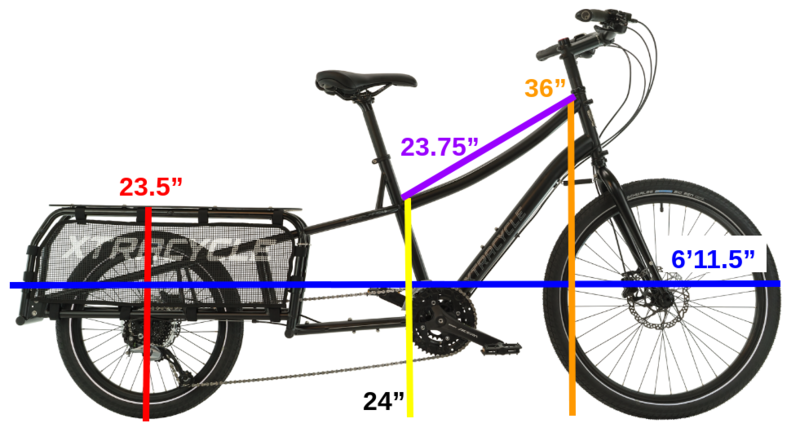 Our frames can comfortably fit riders ranging from 4’10” to 6’4”. An additional advantage of this innovative one-bike-fits-all sizing approach is that it’s super-easy to tweak and/or change out components later if you’re concerned about your fit setup. 3. “Swoop” step-over height: The ER Swoop has a new lower step-over height of 18.5″ that makes mounting and dismounting easier. Earlier models had a step-over height of 25″ on the S/M frame. 4. Thru-axle front hub: The front wheel hub is now a thru-axle hub. Earlier models were quick-release front wheels. Thru-axle hubs offer a stiffer, stronger connection between the wheel and the fork, which helps with handling heavier loads on the bike. The thru-axle hub connects the wheel and fork in a way that makes the wheel much safer and far less likely for an axle to loosen. Thru-axle hubs are also lighter than quick-release wheel hubs. 5. Hydraulic disc brakes: All ER Swoop and Classic models come with hydraulic brakes. Before 2017, only our premium bike models (30D, 8e, 10e) came with hydraulic disc brakes. These brakes require less maintenance. They also don’t loosen over time, since they auto-adjust as the pads wear down. This means you will never have diminished braking. Hydraulic brakes are also more powerful and more reliable due to their dual pad movement. 6. Rear seat braces: Behind the seat tube, there are two new braces that come from the seat tube and attach to the seat stays. This increases rigidity on the back end of the frame for improved stability. 7. Wedding Rings: Along with the tried and true RackLocks (also found on earlier models), our WeddingRings help create a more secure connection between the V-racks and the bike frame. The WeddingRings bolt onto the bike frame and have an O-ring that the V-racks slide through. Once the V-racks are through the rings and secured in the bike frame with the RackLocks, the WeddingRings and tightened to pull the V-racks in toward the bike frame. These help create less movement of V-racks and hold V-racks tight to the bike frame. 8. X3 Bag System: All ER Swoops and Classics come stock with a pair of WheelSkirts. WheelSkirts are the minimum requirement for safe riding of passengers on the FlightDeck, as they prevent passenger’s feet from getting caught up in the wheel. You can upgrade the bag system from there depending on your needs: carrying groceries, bulky items, etc. 9. KickBack 3 (not pictured, optional): The new KB3 is not included in the base price of the ER Swoop and Classic. This gives customers the option to either opt out of a kickstand, use another brand’s kickstand, or upgrade to the KB3. If purchased along with a bike or Leap kit, $50 will be knocked off the price. 10. Centered rear wheel: The rear derailleur on the ER Swoop and Classic has been offset inward a few millimeters to make it more centered on the frame. This gives the rear wheel more even spoke tension, making it stronger. The rear wheel is still a quick release (unlike the new front thru-axle) since having a thru-axle rear wheel is not as beneficial as a front thru-axle wheel hub. 11. 27 gears on all bikes: All ER Swoop and Classic models come with 27 gears (3 chainrings in front, 9 cogs in back, 27 “speeds”). Earlier models featured various gear combos. 12. Adjustable deck height: For riders who want to lower the deck height even further than the stock 23.5″, our V-racks can be cut down to accommodate a deck height of just 19.5″. 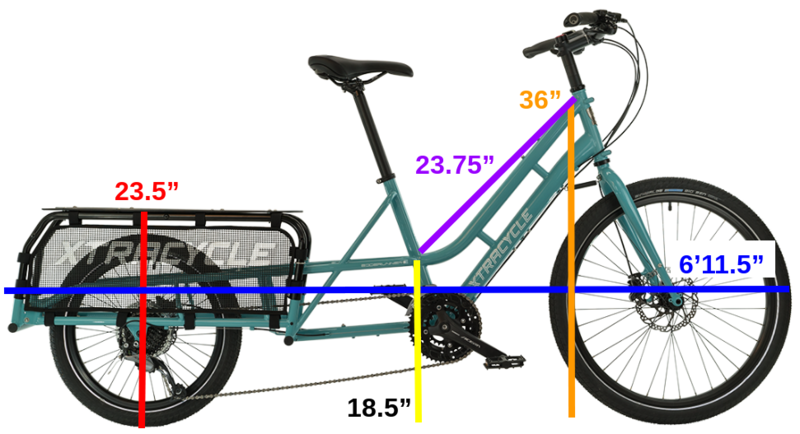 If you have any questions, email us at support@xtracycle.com or head over to your nearest Xtracycle dealer!